Since we're on a new server I think we need a new topic. Also with a new topic I can just update the first post with new maps and server info. Currently New Cboxia is working on building a cityscape. As such if you wish to build within town limits, please wait until a block has been marked off by our road crews. If you need a building space bigger than a standard city block (a 50x50 space) let us know. We actually have a city planning office where users can leave signs to request anything. Also, please let us know if you need running water in your structure, so we can connect it to the sewer line. We ask that you refrain from building on another user's property without their express permission. Outside of the city, you can build wherever (just make sure not to be so close that the city will hit you structure when it expands). If you're not sure if you're too close, ask a mod or admin to confirm. There is to be no unauthorized explosive ordnance within city limits. 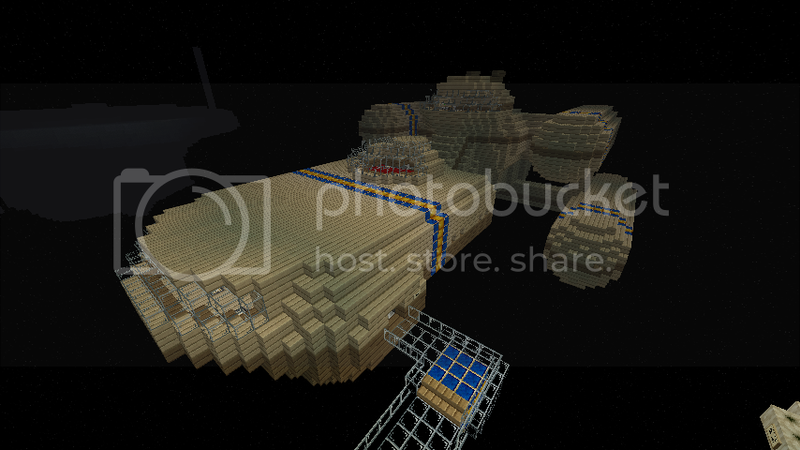 Also, feel free to discuss what's going on in the server here, and post screenshots of your projects. I'll try to put up an updated map weekly. Last edited by Valdor on Mon Sep 10, 2012 12:46 am, edited 23 times in total. As for a nation? Considering it, yet I have one on my own server I'm trying to build up. Last edited by ArcticKitsune on Mon Apr 23, 2012 1:13 am, edited 2 times in total. Guess I'll do a post now that New Jesstantinople is rising from the ashes. I don't have proper screenshots of anything I've done in the city limits though... Which now that the snowflake is moved is only the towers which are technically still unfinished, hence no screenshots. Anyway. The spiral-stair quad-towers in town are mine (bottom-right corner of Val's first picture), the coordinates for the future home of the New Jesstantinople Welcome Center are posted by the fountain there. New Jesstantinople currently consists of the swamp and bordering biomes located there. Please no unauthorized explosives, large-scale building, or terraforming in the area without prior permission; however, if it's something that can easily be reversed with no hassle then feel free, as long as you're aware I might get rid of it because I'm picky and territorial and OCD. Note to city planning committee: Jesstantinople is not to be connected to the core town of Cboxia via sewer, power, road, minecart, airport, or stargate; all travel must be directed through the port or by the /warp command. No, I am not changing the name to Jessagascar. 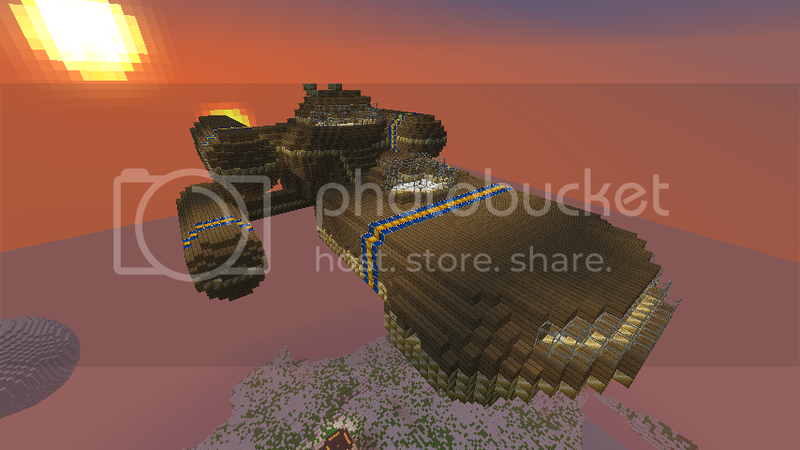 Xehndinavia Technologies proudly presents its newest airship model, the Hyperborea class. Currently docked at Blue Sphere is the flagship of the line, the XS-0001 Hyperborea. Currently floating over the city is the second in the line, XS-0002 El Dorado. First, my silly little nation has a welcome center. I kept trying to use a certain trick that would make some of the bookshelves function as chests but it turns out servers don't like it. I have an actual house now, in which I had a lot of fun with the new wood colors. No interior shots (yet), it's rather cramped inside and hard to get a good view without taking a dozen screencaps. Which I did but didn't upload. And lastly, Graffias has been moved to the Jesstantinople Art Gallery, which is probably what I'm going to end up working on the most on the server. I'm using the plugin toggles to let me have a sort of image viewer thingy rather than taking up several continents with pixel art. There's also a copy of Valdor's Eukrante there, and the new addition of Partio, who is based on artwork by our own Sonja! wait, do I have to buy anything to join this town? ...do... you know what Minecraft is? If not, you'd have to buy the game. I am pleased to announce that Cboxia is now running the latest version of Craftbukkit! The Jesstantinople Art Gallery is now a proper gallery. I've also installed optifine recently so I can now take screenshots without fog getting in the way. XD Here's the gallery and the exhibits so far~ Feel free to visit by typing "/warp gallery" into the chat and operating the toggle switches on the wall to view the different exhibits. Ample seating is provided along with records for the jukebox.